Jessie: [to imaginary bullies] Hey, give me my lunch back! ~Narrator: He wouldn't step in and help, he would... join in the bullying. Cameron: Hahaha, got your lunch stolen, AGAIN! ~Narrator: Between two teams he didn't even like. Cameron: I hate these teams... Oh well. ~Narrator: If he saw a homeless person on the street, he wouldn't give them his change... He'd go to Mc Donald's and eat only half the food he ordered... Throwing out the rest. Jessie: I’ve never flown before, not sure I can do this. ~Narrator: he wouldn't encourage them, he'd.... try and scare them. Jessie: [to imaginary girl] But... I love you!! ~Narrator: he wouldn't comfort them, he would ... Tease them. Cameron: Haha, you're all alone again! ~Narrator: he would never move over. ~Narrator: If he saw someone step in dog poop. Jessie: [walks over and whispers audibly to narrator :] Can we say 'poop' in font of this audience? ~Narrator: I guess so, it's in the script. Jessie: oh no, I have stepped in dog poop. Cameron: Pwaaaaw!!! You stepped in something awful, you stink!!! Get away from me! ~Narrator: If he knew someone who was embarrassed about their body, he wouldn't ignore it, but... make fun of it. Cameron: Wow your chin is really, really, REALLY big! ~Narrator: He wouldn't ignore the error, he would tell everyone he saw about the error. One day the boy was at the supermarket. He was on his way to buy some breakfast cereal when he saw an old man struggling to reach the top shelf. 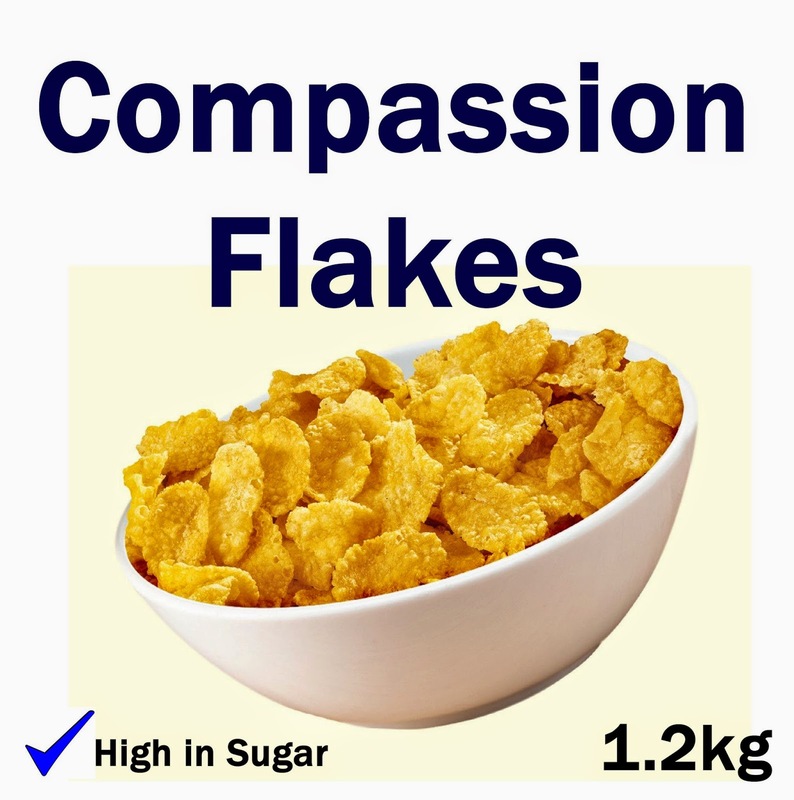 As he was staring at the man, having a little laugh to himself, he missed the box of cornflakes he was reaching for and accidentally grabbed a box of ... Compassion Flakes. The next morning, the boy was watching the morning news while eating the compassion flakes, and something strange happened. He started feeling sorry for the people who were homeless from the earthquake! He actually wanted to find a way to help them and one of his eyes even started to cry a little! It seemed this boy now had compassion for people. ~Narrator: He wouldn't laugh he would ...help. Cameron: I'm sorry to hear about your pet! ~Narrator: If he saw someone being bullied He would... be a friend. Cameron: Got your lunch stolen again? Want some of mine? ~Narrator: If he saw a homeless person on the street... he would give them his change. ~Narrator: If someone was afraid of flying, He would... encourage them. Cameron: We'll be fine - I fly all the time! Cameron: Mate we should go play some basketball, help you take your mind off her. ~Narrator: If he saw someone step in dog poop. He would ... quietly mention it. Cameron: I think you stepped in something! ~Narrator: If he knew someone who was embarrassed about their body, he would ignore it. Cameron: (see a big chin, is shocked by it, but says) Um, how about the weather! Cameron: Nice item! Well done. ~Narrator: In fact, with his life filled with compassion, he was now one of the nicest people you'll ever meet. 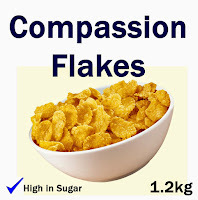 Boys and girls, unfortunately you can no longer buy compassion flakes at the supermarket.... as they were very high in sugar.... Fortunately, you CAN choose to be compassionate all by yourself. And I think we all agree, if everyone was compassionate, what a better world it would be to 'in live' ... I mean live in!